CPS Products are synonymous with quality and design ingenuity. The tools have great functionality and are easy to use. The manifolds have replaceable diaphragms so that they can be repaired instead of replaced. This means that you should only need to purchase a piece of equipment once, look after it and it will last a long time, but in the event of failure it should be repairable. 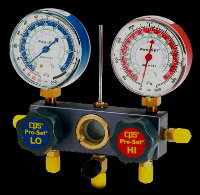 The equipment is great value for money and is truly professional standard service equipment for the professional refrigeration engineer. You may be able to by a little cheaper, but why compromise when you need this equipment to earn your living. There is a vast range of items available, feel free to contact us for help with your selection. Each service item carries a two year warranty.